Daniel 7:9, Psalm 96, Acts i.1 St. Luke xxiv. 49. When the disciples intend to ask anything, they approach Him together, that by dint of numbers they may abash Him into compliance. They well knew that in what He had said previously, "Of that day knoweth no man" (Matt. xxiv. 36), He had merely declined telling them: therefore they again drew near, and put the question. They would not have put it had they been truly satisfied with that answer. For having heard that they were about to receive the Holy Ghost, they, as being now worthy of instruction, desired to learn. Also they were quite ready for freedom: for they had no mind to address themselves to danger; what they wished was to breathe freely again; for they were no light matters that had happened to them, but the utmost peril had impended over them. And without saying any thing to Him of the Holy Ghost, they put this question: "Lord, wilt Thou at this time restore the kingdom to Israel?" They did not ask, when? but whether "at this time." So eager were they for that day. Indeed, to me it appears that they had not any clear notion of the nature of that kingdom; for the Spirit had not yet instructed them. And they do not say, When shall these things be? but they approach Him with greater honour, saying, "Wilt Thou at this time restore again the kingdom," as being now already fallen. For there they were still affected towards sensible objects, seeing they were not yet become better than those who were before them; here they have henceforth high conceptions concerning Christ. Since then their minds are elevated, He also speaks to them in a higher strain. For He no longer tells them, "Of that day not even the Son of Man knoweth" (Mark xiii. 32); but He says, It is not for you to know the times or the seasons which the Father hath put in His own power (Acts i. 7.) Ye ask things greater than your capacity, He would say. And yet even now they learned things that were much greater than this. And that you may see that this is strictly the case, look how many things I shall enumerate. What, I pray you, was greater than their having learned what they did learn? Thus, they learned that there is a Son of God, and that God has a Son equal with Himself in dignity (John v. 17-20); they learned that there will be a resurrection (Matt. xvii. 9); that when He ascended He sat on the right hand of God (Luke xxii. 69); and what is still more stupendous, that Flesh is seated in heaven, and adored by Angels, and that He will come again (Mark xvi. 19); they learned what is to take place in the judgment (Matt. xvi. 27); learned that they shall then sit and judge the twelve tribes of Israel (Luke xxi. 27); learned that the Jews would be cast out, and in their stead the Gentiles should come in (Matt. xix. 28). For, tell me, which is greater? to learn that a person will reign, or to learn the time when? (Luke xxi. 24). Paul learned "things which it is not lawful for a man to utter" (2 Cor. xii. 4); things that were before the world was made, he learned them all. Which is the more difficult, the beginning or the end? Clearly to learn the beginning. This, Moses learned, and the time when, and how long ago: and he enumerates the years. And the wise Solomon saith, "I will make mention of things from the beginning of the world." And that the time is at hand, they do know: as Paul saith, "The Lord is at hand, be careful for nothing." (Phil. iv. 5). These things they knew not [then], and yet He mentions many signs (Matt. ch. xxiv). Then, that they may make no more enquiries, straightway He was received up. Thus, just as on the former occasion He had darkened their minds by awe, and by saying, "I know not;" here also He does so by being taken up. For great was their eagerness on the subject, and they would not have desisted; and yet it was very necessary that they should not learn this. For tell me, which do the Gentiles most disbelieve? that there will be a consummation of the world, or that God is become man, and issued from the Virgin? But I am ashamed of dwelling on this point, as if it were about some difficult matter. Then again, that the disciples might not say, Why dost thou leave the matter in suspense? He adds, "Which the Father hath put in His own power." And yet He declared the Father's power and His to be one: as in the saying, "For as the Father raiseth up the dead and quickeneth them, even so the Son quickeneth whom He will." (John v. 21.) If where need is to work, Thou actest with the same power as the Father; where it behooves to know, dost Thou not know with the same power? Yet certainly to raise up the dead is much greater than to learn the day. If the greater be with power, much more the other. But just as when we see a child crying, and pertinaciously wishing to get something from us that is not expedient for him, we hide the thing, and show him our empty hands, and say, "See, we have it not:" the like has Christ here done with the Apostles. But as the child, even when we show him [our empty hands], persists with his crying, conscious he has been deceived, and then we leave him, and depart, saying, "Such an one calls me:" and we give him something else instead, in order to divert him from his desire, telling him it is a much finer thing than the other, and then hasten away; in like manner Christ acted. The disciples asked to have something, and He said He had it not. And on the first occasion he frightened them. Then again they asked to have it now: He said He had it not; and He did not frighten them now, but after having shown [the empty hands], He has done this, and gives them a plausible reason: "Which the Father," He says, "hath put in his own power." What? Thou not know the things of the Father! Thou knowest Him, and not what belongs to Him! And yet Thou hast said, "None knoweth the Father but the Son" (Luke x. 25); and, "The Spirit searcheth all things, yea, the deep things of God" (1 Cor. ii. 10); and Thou not know this! But they feared to ask Him again, lest they should hear Him say, "Are ye also without understanding?" (Matt. xv. 26.) For they feared Him now much more than before. "But ye shall receive power, after that the Holy Ghost is come upon you." As in the former instance He had not answered their question (for it is the part of a teacher to teach not what the disciple chooses, but what is expedient for him to learn), so in this, He tells them beforehand, for this reason, what they ought to know, that they may not be troubled. In truth, they were yet weak. But to inspire them with confidence, He raised up their souls, and concealed what was grievous. Since he was about to leave them very shortly, therefore in this discourse He says nothing painful. But how? He extols as great the things which would be painful: all but saying, "'Fear not': for ye shall receive power, after that the Holy Ghost is come upon you; and ye shall be witnesses unto Me both in Jerusalem, and in all Judea, and in Samaria." For since he had said, "Go not into the way of the Gentiles, and into any city of the Samaritans enter ye not" (Matt. x. 5), what there He left unsaid, He here adds, "And to the uttermost part of the earth;" and having spoken this, which was more fearful than all the rest, then that they may not again question Him, He held His peace. "And having this said, while they beheld, He was taken up; and a cloud received Him out of their sight" (v. 9). Seest thou that they did preach and fulfil the Gospel? For great was the gift He had bestowed on them. In the very place, He says, where ye are afraid, that is, in Jerusalem, there preach ye first, and afterwards unto the uttermost part of the earth. Then for assurance of what He had said, "While they beheld, He was taken up." Not "while they beheld" did He rise from the dead, but "while they beheld, He was taken up." Inasmuch, however, as the sight of their eyes even here was not all-sufficient; for in the Resurrection they saw the end, but not the beginning, and in the Ascension they saw the beginning, but not the end: because in the former it had been superfluous to have seen the beginning, the Lord Himself Who spake these things being present, and the sepulchre showing clearly that He is not there; but in the latter, they needed to be informed of the sequel by word of others: inasmuch then as their eyes do not suffice to show them the height above, nor to inform them whether He is actually gone up into heaven, or only seemingly into heaven, see then what follows. That it was Jesus Himself they knew from the fact that He had been conversing with them (for had they seen only from a distance, they could not have recognized Him by sight), but that He is taken up into Heaven the Angels themselves inform them. Observe how it is ordered, that not all is done by the Spirit, but the eyes also do their part. But why did "a cloud receive Him?" This too was a sure sign that He went up to Heaven. Not fire, as in the case of Elijah, nor fiery chariot, but "a cloud received Him;" which was a symbol of Heaven, as the Prophet says; "Who maketh the clouds His chariot" (Ps. civ. 3); it is of the Father Himself that this is said. Therefore he says, "on a cloud;" in the symbol, he would say, of the Divine power, for no other Power is seen to appear on a cloud. For hear again what another Prophet says: "The Lord sitteth upon a light cloud" (Is. xix. 1). For it was while they were listening with great attention to what He was saying, and this in answer to a very interesting question, and with their minds fully aroused and quite awake, that this thing took place. Also on the mount [Sinai] the cloud was because of Him: since Moses also entered into the darkness, but the cloud there was not because of Moses. 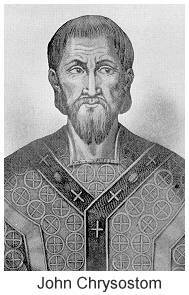 And He did not merely say, "I go," lest they should again grieve, but He said, "I send the Spirit" (John xvi. 5, 7); and that He was going away into heaven they saw with their eyes. O what a sight they were granted! "And while they looked stedfastly," it is said, "toward heaven, as he went up, behold, two men stood by them in white apparel; which also said, Ye men of Galilee, why stand ye gazing up into heaven? This same Jesus, which is taken up from you into heaven"-they used the expression "This" demonstratively, saying, "this Jesus, which is taken up from you into heaven, shall thus"-demonstratively, "in this way"-"come in like manner as ye have seen Him going into heaven." (v. 10, 11.) Again, the outward appearance is cheering ["in white apparel"]. They were Angels, in the form of men. And they say, "Ye men of Galilee:" they showed themselves to be trusted by the disciples, by saying, "Ye men of Galilee." For this was the meaning: else, what needed they to be told of their country, who knew it well enough? By their appearance also they attracted their regard, and shewed that they were from heaven. But wherefore does not Christ Himself tell them these things, instead of the Angels? He had beforehand told them all things; ["What if ye shall see the Son of Man] going up where He was before?" (John vi. 62). 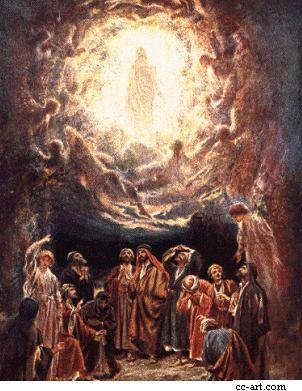 Moreover the Angels did not say, 'whom you have seen taken up,' but, "going into heaven:" ascension is the word, not assumption; the expression "taken up," belongs to the flesh. For the same reason they say, "He which is taken up from you shall thus come," not, "shall be sent," but, "shall come. He that ascended, the same is he also that descended" (Eph. iv. 10). So again the expression, "a cloud received Him:" for He Himself mounted upon the cloud. Of the expressions, some are adapted to the conceptions of the disciples, some agreeable with the Divine Majesty. Now, as they behold, their conceptions are elevated: He has given them no slight hint of the nature of His second coming. For this, "Shall thus come," means, with the body; which thing they desired to hear; and, that he shall come again to judgment "thus" upon a cloud. "And, behold, two men stood by them." Why is it said, "men?" Because they had fashioned themselves completely as such, that the beholders might not be overpowered. "Which also said:" their words moreover were calculated for soothing: "Why stand ye gazing up into heaven?" They would not let them any longer wait there for Him. Here again, these tell what is greater, and leave the less unsaid. That "He will thus come," they say, and that "ye must look for Him from heaven." For the rest, they called them off from that spectacle to their saying, that they might not, because they could not see Him, imagine that He was not ascended, but even while they are conversing, would be present ere they were aware. For if they said on a former occasion, "Whither goest Thou?" (John xiii. 36) much more would they have said it now. "Wilt Thou at this time," say they, "restore the kingdom to Israel?" (Recapitulation). They so well knew his mildness, that after His Passion also they ask Him, "Wilt thou restore?" And yet He had before said to them, "Ye shall hear of wars and rumors of wars, but the end is not yet," nor shall Jerusalem be taken. But now they ask Him about the kingdom, not about the end. And besides, He does not speak at great length with them after the Resurrection. They address then this question, as thinking that they themselves would be in high honor, if this should come to pass. But He (for as touching this restoration, that it was not to be, He did not openly declare; for what needed they to learn this? hence they do not again ask, "What is the sign of Thy coming, and of the end of the world?" for they are afraid to say that: but, "Wilt Thou restore the kingdom to Israel?" for they thought there was such a kingdom), but He, I say, both in parables had shown that the time was not near, and here where they asked, and He answered thereto, "Ye shall receive power," says He, "when the Holy Ghost is come upon you. Is come upon you," not, "is sent," [to shew the Spirit's coequal Majesty. How then darest thou, O opponent of the Spirit, to call Him a creature?]. "And ye shall be witnesses to Me." He hinted at the Ascension. ["And when he had spoken these things.] Which they had heard before, and He now reminds them of. ["He was taken up."] Already it has been shown, that He went up into heaven. ["And a cloud, etc."] "Clouds and darkness are under His feet," (Ps. xviii. 9; xcvii. 2) saith the Scripture: for this is declared by the expression, "And a cloud received Him:" the Lord of heaven, it means. For as a king is shown by the royal chariot, so was the royal chariot sent for Him. ["Behold, two men, etc.] That they may vent no sorrowful exclamations, and that it might not be with them as it was with Elisha, (2 Kings ii. 12) who, when his master was taken up, rent his mantle. And what say they? "This Jesus, which is taken up from you into heaven, shall thus come." And, "Behold, two men stood by them." (Matt. xviii. 16.) With good reason: for "in the mouth of two witnesses shall every word be established" (Deut. xvii. 6): and these utter the same things. And it is said, that they were "in white apparel." In the same manner as they had already seen an Angel at the sepulchre, who had even told them their own thoughts; so here also an Angel is the preacher of His Ascension; although indeed the Prophets had frequently foretold it, as well as the Resurrection. Everywhere it is Angels as at the Nativity, "for that which is conceived in her," saith one, "is by the Holy Ghost" (Matt. i. 20): and again to Mary, "Fear not, Mary." (Luke i. 30.) And at the Resurrection: "He is not here; He is risen, and goeth before you." (ib. xxiv. 6.) "Come, and see!" (Matt. xxviii. 6.) And at the Second Coming. For that they may not be utterly in amaze, therefore it is added, "Shall thus come." (ib. xxv. 31.) They recover their breath a little; if indeed He shall come again, if also thus come, and not be unapproachable! And that expression also, that it is "from them" He is taken up, is not idly added. And of the Resurrection indeed Christ Himself bears witness (because of all things this is, next to the Nativity, nay even above the Nativity, the most wonderful: His raising Himself to life again): for, "Destroy," He says, "this Temple, and in three days I will raise it up." (John ii. 19.) "Shall thus come," say they. If any therefore desires to see Christ; if any grieves that he has not seen Him: having this heard, let him show forth an admirable life, and certainly he shall see Him, and shall not be disappointed. For Christ will come with greater glory, though "thus," in this manner, with a body; and much more wondrous will it be to see Him descending from heaven. But for what He will come, they do not add. ["Shall thus come," etc.] This is a confirmation of the Resurrection; for if he was taken up with a body, much rather must He have risen again with a body. Where are those who disbelieve the Resurrection? Who are they, I pray? Are they Gentiles, or Christians? for I am ignorant. But no, I know well: they are Gentiles, who also disbelieve the work of Creation. For the two denials go together: the denial that God creates any thing from nothing, and the denial that He raises up what has been buried. But then, being ashamed to be thought such as "know not the power of God" (Matt. xxii. 29), that we may not impute this to them, they allege: We do not say it with this meaning, but because there is no need of the body. Truly it may be seasonably said, "The fool will speak foolishness." (Is. xxxii. 6.) Are you not ashamed not to grant, that God can create from nothing? If he creates from matter already existing, wherein does He differ from men? But whence, you demand, are evils? Though you should not know whence, ought you for that to introduce another evil in the knowledge of evils? Hereupon two absurdities follow. For if you do not grant, that from things which are not, God made the things which are, much more shall you be ignorant whence are evils: and then, again, you introduce another evil, the affirming that Evil is uncreated. Consider now what a thing it is, when you wish to find the source of evils, to be both ignorant of it, and to add another to it. Search after the origin of evils, and do not blaspheme God. And how do I blaspheme? says he. When you make out that evils have a power equal to God's; a power uncreated. For, observe what Paul says; "For the invisible things of Him from the creation of the world are clearly seen, being understood by the things that are made." (Rom. i. 20.) But the devil would have both to be of matter, that there may be nothing left from which we may come to the knowledge of God. For tell me, whether is harder: to take that which is by nature evil (if indeed there be ought such; for I speak upon your principles, since there is no such thing as evil by nature), and make it either good, or even coefficent of good? or, to make of nothing? Whether is easier (I speak of quality); to induce the non-existent quality; or to take the existing quality, and change it into its contrary? where there is no house, to make the house; or where it is utterly destroyed, to make it identically exist again? Why, as this is impossible, so is that: to make a thing into its opposite. Tell me, whether is harder; to make a perfume, or to make filth have the effect of perfume? Say, whether of these is easier (since we subject God to our reasonings: nay, not we, but ye); to form eyes, or to make a blind man to see continuing blind, and yet more sharp-sighted, than one who does see? To make blindness into sight, and deafness into hearing? To me the other seems easier. Say then do you grant God that which is harder, and not grant the easier? But souls also they affirm to be of His substance. Do you see what a number of impieties and absurdities are here! In the first place, wishing to show that evils are from God, they bring in another thing more impious than this, that they are equal with Him in majesty, and God prior in existence to none of them, assigning this great prerogative even to them! In the next place, they affirm evil to be indestructible: for if that which is uncreated can be destroyed, ye see the blasphemy! So that it comes to this, either that nothing is of God if not these; or that these are God! Thirdly, what I have before spoken of, in this point they defeat themselves, and prepare against themselves fresh indignation. Fourthly, they affirm unordered matter to possess such inherent power. Fifthly, that evil is the cause of the goodness of God, and that without this the Good had not been good. Sixthly, they bar against us the ways of attaining unto the knowledge of God. Seventhly, they bring God down into men, yea plants and logs. For if our soul be of the substance of God, but the process of its transmigration into new bodies brings it at last into cucumbers, and melons, and onions, why then the substance of God will pass into cucumbers! And if we say, that the Holy Ghost fashioned the Temple [of our Lord's body] in the Virgin, they laugh us to scorn: and if, that He dwelt in that spiritual Temple, again they laugh; while they themselves are not ashamed to bring down God's substance into cucumbers, and melons, and flies, and caterpillars, and asses, thus excogitating a new fashion of idolatry: for let it not be as the Egyptians have it, "The onion is God;" but let it be, "God in the onion"! Why dost thou shrink from the notion of God's entering into a body? 'It is shocking,' says he. Why then this is much more shocking. But, forsooth, it is not shocking-how should it be?-this same thing which is so, if it be into us! 'But thy notion is indeed shocking.' Do ye see the filthiness of their impiety?-But why do they not wish the body to be raised? And why do they say the body is evil? By what then, tell me, dost thou know God? by what hast thou the knowledge of existing things? The philosopher too: by means of what is he a philosopher, if the body does nothing towards it? Deaden the senses, and then learn something of the things one needs to know! What would be more foolish than a soul, if from the first it had the senses deadened? If the deadening of but a single part, I mean of the brain, becomes a marring of it altogether; if all the rest should be deadened, what would it be good for? Show me a soul without a body. Do you not hear physicians say, The presence of disease sadly enfeebles the soul? How long will ye put off hanging yourselves? Is the body material? tell me. "To be sure, it is." Then you ought to hate it. Why do you feed, why cherish it? You ought to get quit of this prison. But besides: "God cannot overcome matter, unless he implicate himself with it: for he cannot issue orders to it (O feebleness!) until he close with it, and take his stand (say you) through the whole of it!" And a king indeed does all by commanding; but God, not by commanding the evil! But let not us endure them, let us block up our ears against them. For there is, yea, there is, a resurrection of bodies. This the sepulchre which is at Jerusalem declares, this the pillar to which He was bound, when He was scourged. For, "We did eat and drink with Him," it is said. Let us then believe in the Resurrection, and do things worthy of it, that we may attain to the good things which are to come, through Christ Jesus our Lord, with Whom to the Father, and the Holy Ghost together, be power, honor, now and for ever, world without end. Amen.